Dentofacial deformity is a commonly found disorder in people, resulting from the imbalance in the size, position, shape or orientation of the bones constituting the upper and lower jaws. The issues of dentofacial deformities were detected and treatments sorted more than a century ago. The disorder can be successfully treated now, with the help of Bilateral Sagittal Split Osteotomy (BSSRO). Dentofacial deformity is a name used to classify several disorders and irregularities that are described below. Upper jaw deficiency – upper jaw deficiency is an irregularity that can be detected from childhood. Here the upper jaw appears to be smaller than the lower jaw. Long face and gummy smile – an irregularity caused due to extended gums which are bigger than teeth and gives the look of a longer shaped face. 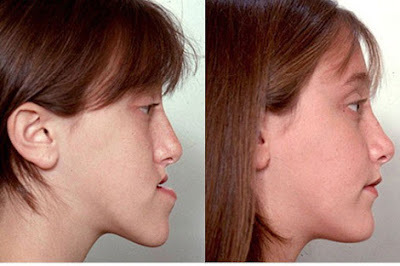 Short face deformity – the face appears to be short due to a jaw irregularity. Jaw asymmetry – an irregularity caused due to disproportionate jaws. Open bite – an irregularity that occurs when the teeth in upper and lower jaw do not meet. This irregularity leaves a gap in teeth disabling the ability to close mouth completely. Lower jaw recession – the lower jaws appear to be behind its original position in this irregularity. Lower jaw protrusion – the lower jaw protrudes from its original position in this deformity. Lower jaw fracture – this is a case of dentofacial deformity that are caused due to accidents. Here the bone or jaw structures are impaired due to fracture of the bones. The type and extent of dental deformity can be diagnosed with the help of X-Rays, dental models, photographs or through clinical examination. In cases of sleep apnoea related to the deformity, sleep studies are also done. The deformities can be visible from birth or starts to show after adolescence, when the bone structures are fully grown. The procedure involves a surgical procedure when the bone structures are repaired and restructured to correct the deformity and thereby restoring the facial aesthetics. One of the leading centres of implantology and maxillofacial surgery in the state, JP Dentofacial and Implantology clinic offers expert treatment under the expertise of Dr. Philip Mathew.